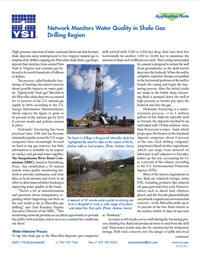 High-pressure injection of water, sand, and chemicals that fracture shale deposits deep underground to free trapped natural gas is employed by drillers tapping the Marcellus shale beds, a geologic deposit that stretches from central New York to Virginia and contains gas believed to be worth hundreds of billions of dollars. The process, called hydraulic fracturing, or fracking, has raised concerns about possible impacts on water quality. Tightly held "shale gas" like that in the Marcellus shale deposits accounted for 14 percent of the U.S. natural gas supply in 2009, according to the U.S. Energy Information Administration, which expects the figure to grow to 45 percent of the nation's gas by 2035 if current trends and policies remain in place. Hydraulic fracturing has been practiced since 1949 and has become extremely popular across the U.S. as gas companies have increasingly focused on hard-to-tap gas reserves, but little information is available on its impact on surface and ground water supplies. The Susquehanna River Basin Commission (SRBC), based in Harrisburg, PA, has established a 50-station remote water quality monitoring network to provide continuous, real-time data on local streams and rivers in an effort to determine whether fracking is impacting water quality in the basin. "There's a lot of misinformation and questions about transparency regarding what's happening out there in the real world as far as Marcellus gas drilling," says Tom Beauduy, Deputy Executive Director of the SRBC. "This monitoring network provides an excellent opportunity to provide the public with real data, and to serve as a sentinel for conditions out there."